What is a High Speed Handpiece? A hand held drill, usually air-driven (can also be electric), that spins cutting burs at approximately 400,000 RPM. Used for cavity preparation, removal of tooth structure and margin creation. How Does a High Speed Handpiece Work? Air turns a turbine located in the head (front) of the handpiece. The turbine consists of two miniature bearings, an impeller, and a spindle/chuck assembly that holds the bur. 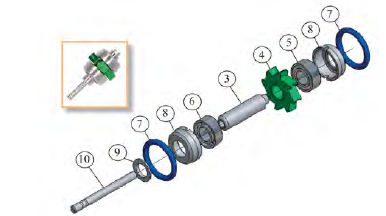 Air is introduced into the handpiece via the chair unit foot pedal, goes through the airline attached to the back end of the handpiece, up through the handpiece shell, and into the handpiece head where it is forced over the impeller of the turbine, causing the turbine to spin. How Fast Does the Handpiece Run? The speed depends on the pressure (PSI) of the air supply, the size of the turbine assembly and the configuration of the turbine components (i.e., bearings,impeller, and spindle). An average sized turbine (such as a Midwest Tradition) running at 38 PSI should spin at approximately 400,000 RPM. Larger sized turbines (such as a KaVo Super Torque) running at 38 PSI should spin at approximately 325,000 RPM but will achieve the same torque as smaller turbines due to their mass. Most brands of handpieces offer small (miniature) and large head versions, and different brands vary (KaVo tends to have larger heads and Star has smaller heads). Smaller heads have advantages for providing better visability and easier access (especially with children). Larger heads have the advantage of much higher torque and cutting power. How Long Will a Handpiece Turbine Last? The average life span of a handpiece turbine ranges from six to twelve months, depending on the level of use and maintenance procedures. The most common cause of premature failures is infield conditions.